Washington Monthly | Is Financialization Causing Labor’s Collapsing Income Share? 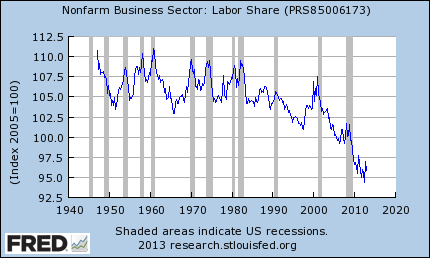 Is Financialization Causing Labor’s Collapsing Income Share? While all economists agree that the financial sector contributes significantly to economic growth, some now question whether that is still the case. According to Stephen G. Cecchetti and Enisse Kharroubi of the Bank for International Settlements, the impact of finance on economic growth is very positive in the early stages of development. But beyond a certain point it becomes negative, because the financial sector competes with other sectors for scarce resources. The specific mechanical arguments get quickly complicated, but what they generally boil down to is that the financial sector has increasingly little do with real investment—the classic “uniting savers and borrowers.” In reality, almost all corporate investment is financed out of profits. Financial markets are instead a critical mechanism of organization and control, even of nonfinancial companies, and financial techniques are powerful tools to manipulate outcomes throughout the economy in favor of owners and managers. There are vast sums to be made standing astride the bloodstream of capitalism. One classic technique is by inducing a recession through tight monetary policy to weaken labor’s bargaining power and thus preserve the value of financial assets. Due to globalization and the total collapse of unions, this hasn’t been necessary for many years in the US; rentier class warfare happens via other mechanisms. Require banks to hold huge reserves. Require direct lending to the government by captive domestic institutions, such as pension fund–the French are already requiring people to do. Explicit or implicit caps on interest rates. Public ownership of banks. Having the Federal Reserve talk to banks, saying: “You aren’t holding enough Treasuries. We will remember this when you need something from us.” The dividing line between macroprudential regulation requiring large holdings of safe assets on the one hand on the one hand and financial repression to make it easier for the government to borrow on the other hand is a very thin line indeed. Unlike episodes of financial depression in developing countries–which we economists argue have had large destructive effects on countries’ ability to mobilize capital for productive investment and growth–when we try to find any damaging effects of financial repression on American economic growth over 1945-1970, we cannot find it. That doesn’t mean we want to go back to the days of Regulation Q, of forced narrow banking, and of much higher reserve requirements. But this does mean that a lot of issues are not as clear as we would like them to be. It may be that heavy financial regulation imposes some distortionary effect. But unchained finance scuttling around one’s economy looks none too healthy either.